Honda's Acura hit a square bullseye when they unveiled the Acura NSX Concept at the North American International Auto Show this year. The car made headlines and was one of the most talked about concepts unveiled in Detroit for the 2012 show. Now, Honda has committed to building the car and has given more details about how that will happen. The Acura NSX will be a 2013 model and will hit showrooms late this year or early next. What's more, it will be built here in the U.S.A. at Honda's facilities in Ohio. Conceptual design and engineering work has been handed over to the company's Center of Research and Development in Raymond, Ohio where it will finish its engineering and production development. Many industry prognosticators are guessing that this means a production-ready version of the NSX may be seen at another auto show this year. The 2013 Acura NSX will feature all-wheel drive with Acura perhaps learning a lesson from rival Audi, who's perfected the idea. Like its namesake predecessors, the 2013 Acura NSX will feature a mid-mounted V6 engine, but unlike them, it will have a 7-speed transmission integrated with electric motors to drive the rear wheels and another pair of independent electric motors up front to power that axle. This gives the car a lot of advantages. Its chief advantage will be power off the line, likely giving the NSX a lightning fast quarter mile speed. Its 0-60mph ratings will definitely be rubber-laying. Another advantage will be control. Having two independent motors on the front axle of a rear wheel car is something Audi has demonstrated in many of its supercar concepts before, such as the eTron. It means the motors can be independently controlled to give the car maximum handling and wheel grip in curves and on uneven pavement. Finally, Acura has a new twist on this design: regenerative braking while turning. Since the inside wheel often runs slower than the outer wheels in a curve, that inner wheel with a motor mounted can be used to regenerate electricity as it slows to control the turn. That gives both an unprecedented amount of control in the turn, but also a definite increase in efficiency. 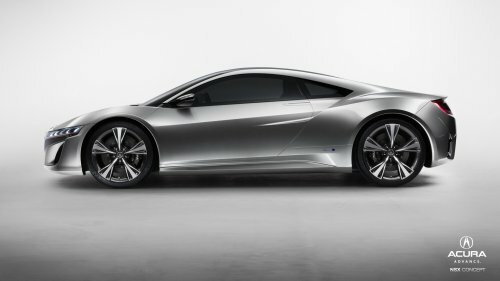 So along with edge-cutting design, the NSX will have some industry-leading technology happening under the hood as well. This may become the most-anticipated new sports car we've seen for some time. LOL Only a retard would call this an Audi NSX... Audi could never make something this nice. Hey Aaron; ACURA... not Audi... so either learn your product or go back to school and learn how to proof-read an article before it's published... HELLO!!!!!!! Anyhow... Great Car... can't wait!!!!! Love how you took the time to leave a whole stack of responses, all saying the same thing and most in all caps. I fixed two (count 'em TWO) typos in the whole article. I counted more than that in just one of your comments. Thanks for playing. That's funny isn't it? Not only that, but it would have been easier to say civilly. The article is comparing the NSX to Acura's RIVAL Audi. You should learn how to read before posting a comment. acura got the idea to go AWD for the NSX from the success of the the nissan gt-r not an audi. the proper comparison would be to the Nissan GT-R----not an audi. Acura saw the success Nissan had with AWD and employed it on the NSX plain and simple. History will repeat itself - Acura is not inspired by one or more other high end awd cars, they are showcasing the future of Honda innovation. In 1990 it was vtech, wireless throttle, all aluminum, titanim connecting rods, etc etc. In 2012 it's awd without the cumbersome mechanical drivetrain, regenerative corner breaking, etc etc. It's going to be exciting to watch this NSX technology trickle down to the rest of the line just as happened with the last one all while Honda receives millions of dollars worth of well deserved exposure from the myriad of cover shots to come! All I can say is that you must have read the article after the corrections were made! If you would have read the original one, the car in question was scribed as the AUDI NSX... comparison or not... that is not correct. The author wrote to me and stated that he corrected the writings. OK? OK! Obviously you didn't see the article in it's original format... before the corrections.... still... it's an ACURA NSX... not an AUDI NSX... OK? OK! All I can say is that after many attempts to post a reply to your article... nothing is seemed would post... so I replied several times... sorry for the repeats!!!!! !